I have seen a lot of crazy things happen in the world recently, and the amount of things I have seen has grown immensely since the "Era of the Social Network", as I like to call it, has taken off like a bat out of hell. Sites like MySpace and Facebook have definitely left their mark on society spawning a lot of interesting things from an award-winning film to numerous law suits over privacy and debates about how secure these sites are. But now I think we may have taken it a little too far. If you are wondering what I am talking about, then let me enlighten you. I am talking about the comic book portraying the life of one of the co-founders of the social media megalord Facebook, Mark Zuckerberg, which hit store shelves today. Bluewater Productions, a comic production company out of Canada, released the "giant-sized" 48-page issue which was written by freelance journalist Jerome Maida and illustrated by Sal Field. According to Maida, "Mark Zuckerberg is the youngest billionaire on the planet and created something that has already had a profound impact on the world. Yet hardly anyone knows much about him. It's amazing." Maida added that he is trying to give context to the complex public figure with his portrayal of Zuckerberg. "Rightly or wrongly, Mark dealt harshly with some people on his way to where he is today. As we see, he left many people feeling betrayed. I try my best to be fair here," Maida added. Zuckerberg became the unwilling center of David Fincher's award-winning film The Social Network thanks to his billionaire status and the multiple lawsuits surrounding Facebook itself. 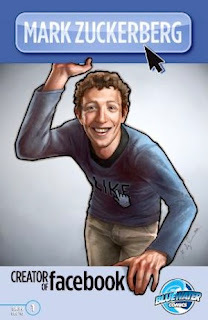 Zuckerberg may also become an animated character thanks to Maida's comic book due to the fact that production company Hayden 5 Media optioned to script the comic into an animated film. If you want the comic book about Zuckerberg, hop on over to your local comic book shop with $6.99 and pick it up today.